“Sparse” coding by cortical neurons, while generating lots of discussion among neuroscientists, brings with it some experimental conundrums: the responses of individual cells are sparse and variable. Thus, pattern detection can be difficult. This week, Kerr et al. measured whisker responses in vivo in layer 2/3 of barrel columns in the rat primary somatosensory cortex. Two-photon calcium imaging allowed detection of single action potentials as calcium transients for each neuron in the population. As expected, single-cell response probability and the fraction of active cells were higher in the principal whisker-related barrel than in surrounding columns. Principal whisker-related neurons also were more likely to respond to stimulus onset and offset than were surround whisker- or septum-related cells. Within a barrel, activity was greater at the center. The correlation between pairs of cells was greater for adjacent cells, and for those located closer to the barrel center. These results were consistent with spatial organization at the barrel level. L2/3 neurons (green) and astrocytes (yellow) in the rat somatosensory cortex in vivo were stained with calcium indicator and sulforhodamine 101, respectively. 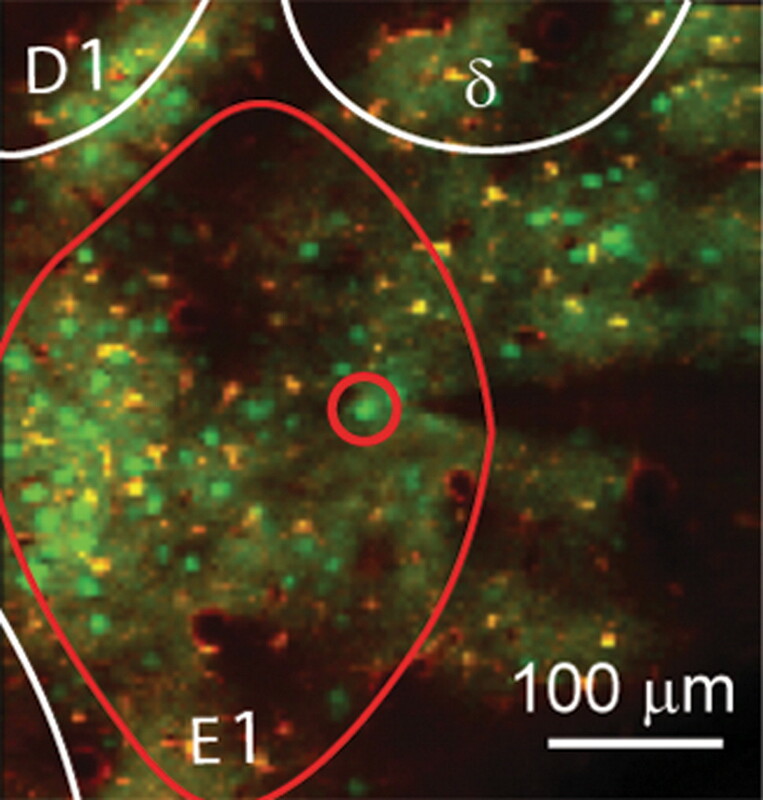 The neuron (small red circle) within the E1 barrel (large red circle) was targeted for cell-attached recording. See the article by Kerr et al. for details. Nothing is more basic to the cell biology of a neuron than the polarization of its processes into dendrites and axons, a process that apparently requires a small orchestra of signaling and cytoskeletal molecules. This week, Garvalov et al. examined neuronal polarity in mice in which the Rho GTPase Cdc42 was conditionally knocked out. Cdc42 has been implicated previously in axonal growth and neuronal polarity. True to form, axons in the null mice in vivo were fewer, shorter, and sparser. In cultured hippocampal neurons from Cdc42−/− animals, the initial growth of neurites appeared normal, but growth of the longest neurite, destined to become the axon, slowed dramatically. Growth cones of the future axon were enlarged, had cytoskeletal abnormalities, and reduced filopodial dynamics. Cofilin, a downstream effector of Cdc42, appeared to be involved in this signaling pathway. Neurons from Cdc42 null mice had increased cofilin phosphorylation and thus reduced cofilin activity in axonal growth cones. “Streaming audio” doesn't automatically bring neuroscience to mind, but in fact this techie term describes how the brain handles competing auditory signals. You know the problem, like when you are trying to hear the boarding announcement in an airport while everyone around you is talking loudly on cell phones. Individual auditory streams can be sorted based on their frequency profiles or spectra. Now Gutschalk et al. show that auditory streams also can be distinguished by their temporal characteristics. Subjects were presented with harmonic complex tones with identical spectra. However, the A and B tones differed in their fundamental frequencies (f0), the lowest frequency in the harmonic series. The greater the difference in f0, the more easily subjects identified separate streams. Functional imaging and magnetoencephalography showed activation in the auditory cortex on a temporal scale similar to subject's reported perception. The magnitude of activation also increased with increasing differences in f0. This week, Carroll et al. investigated the influence of progesterone on the known benefits of estrogen in Alzheimer's disease (AD). Estrogen depletion in postmenopausal women is a risk factor for AD. In female AD mice 3xTg, β-amyloid (Aβ) accumulated with age in neurons of hormone-responsive brain areas including the hippocampus, subiculum, and frontal cortex. Hyperphosphorylation of tau also increased with age, and performance on a working memory task declined. The authors then ovariectomized (OVX) 3xTg-AD mice at 3 months of age and treated them with estrogen (E2) or placebo. As expected, the Aβ load and behavioral performance worsened in OVX mice, effects that were attenuated by E2. Progesterone treatment did not protect against Aβ accumulation after OVX, but it did reduce tau phosphorylation in ovariectomized animals. Progesterone blocked the beneficial effects of E2 on Aβ accumulation, but not on behavior, suggesting that the two hormones have independent functions in this process.